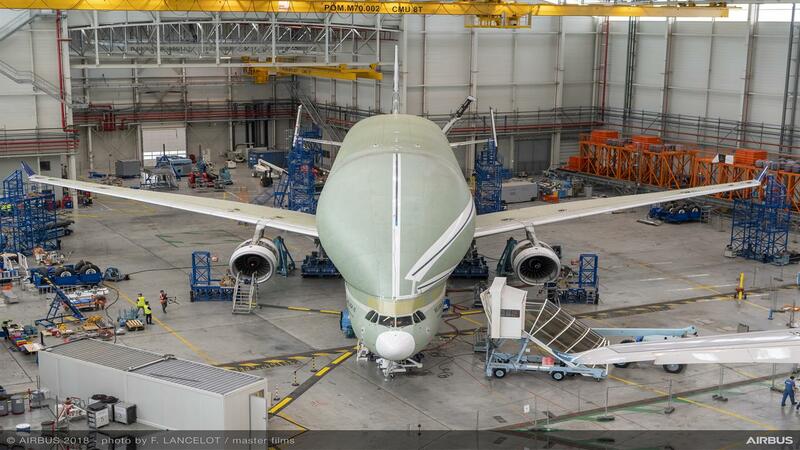 Prototype Airbus Beluga XL undergoing ground vibration testing in Toulouse. 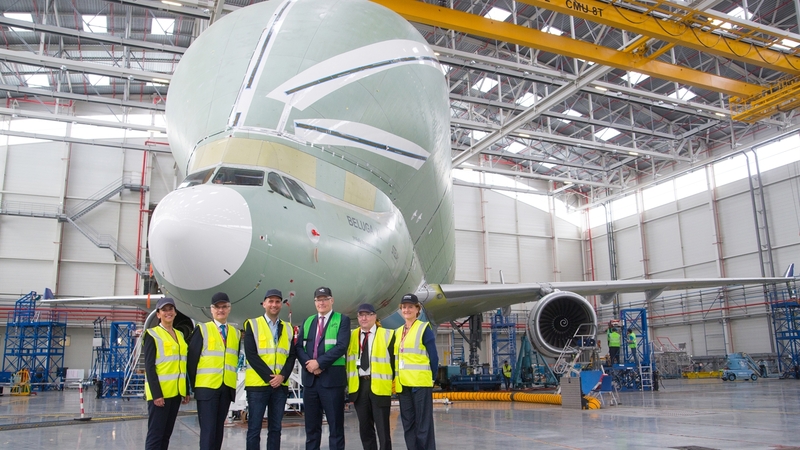 On 6 June 2018, leading representatives of Airbus, DLR and ONERA visited the vibration tests being conducted on the new Beluga XL. From left to right: Grazia Vittadini, Chief Technology Officer, Airbus; Bertrand George, Head of the Beluga XL programme; Marc Fischer, Senior Vice-President Flight Physics, Airbus; Rolf Henke, DLR Executive Board Member for Aeronautics Research; Bruno Sainjon, Chief Executive Officer, ONERA; Veronique Roca, Chief Engineer, Beluga XL. A joint team from the German Aerospace Center (DLR) and the French national aerospace research centre ONERA testing the Beluga XL. Prototype of the Airbus Beluga XL undergoing ground vibration testing in Toulouse. 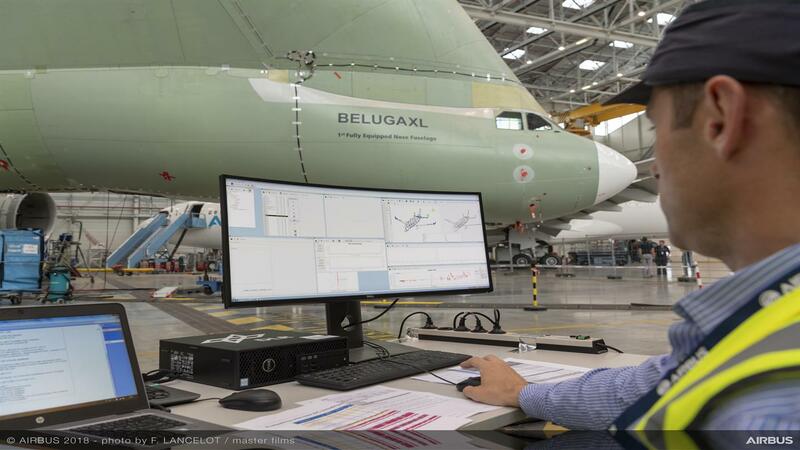 View of the prototype Airbus Beluga XL from the control room. The ground vibration testing was conducted by the German Aerospace Center (Deutsches Zentrum für Luft- und Raumfahrt; DLR) and ONERA (Office National d’Etudes et Recherches Aérospatiales), the French national aerospace research centre. A joint team from the French aerospace research centre ONERA and the German Aerospace Center (DLR) performed the ground vibration testing (GVT) of the new Airbus Beluga XL large transport aircraft. The mission of the new Beluga XL from Airbus is to cope with their production ramp-up and transport more volume. However, before it enters service, much test and certification work has to be done. 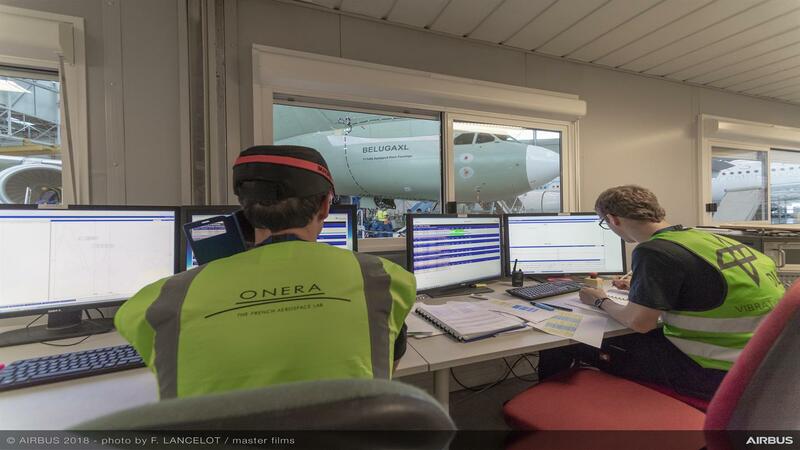 Together with Airbus, ONERA and DLR have investigated the structural behaviour of the impressive new Airbus transport aircraft in a programme of static ground vibration testing (GVT) that ran for eight testing days up to 6 June. The test provides Airbus with valuable information regarding the behaviour of their aircraft before the first flight takes place – an important step in the certification of a new giant. The joint ONERA and DLR team performed the tests very quickly, with high reliability, and efficiently, while providing processed data in near real time. The partner’s expertise was a perfect match to the needs of Airbus. The tests were conducted in compliance with the challenging technical specifications; rapid measurements took only four days for each structural configuration. Rolf Henke, DLR Executive Board Member for Aeronautics Research, said during the joint visit to the tests in Toulouse: "We at DLR are proud to have a long tradition of performing ground vibration tests together with ONERA, having already done this for 10 Airbus prototypes. We are aware of the great responsibility attached to the confidence that Airbus has in the two research organisations. Test by test, DLR is providing all its expertise. GVT methods and analytics are being continuously improved within DLR’s aeronautics research programme." On 6 June 2018, Bruno Sainjon, CEO of ONERA, said: "ONERA, teamed with DLR, is proud to bring its unique expertise to Airbus for this crucial step towards certification of a new aircraft. This role is complementary to ONERA's more traditional one of providing the government with expert advice, including the DGAC (French Civil Aviation Authority), where it contributes to improving aircraft safety." Ground vibration tests are a key part of the overall test programme for every new aircraft, in order to obtain airworthiness certification. The experimental test data provided by GVT are useful to update the mathematical structural model of the aircraft; they are then valuable to predict the vibration amplitudes in operation, and necessary to demonstrate freedom from flutter risks throughout the flight envelope. The tests were conducted in two configurations – with an empty fuselage and loaded with a heavy, tuneable payload. More than 600 sensors, 7000 metres of cable and 300 metres of optical fibres were installed on the fuselage, empennage, engines and wings. The most recent exciter technologies were used to generate vibrations in the aircraft. With their long experience in aircraft GVT, ONERA and DLR have formed a joint team for Airbus GVTs since 1999, notably performing tests for the A320neo, the A350-900 and the A380. With near real time data processing, Airbus receives the results of the tests very quickly. The Beluga XL programme was launched in November 2014 to address the additional transport and increased capacity requirements for Airbus beyond 2019. The new oversized air transporters are based on the A330-200 freighter, with extensive re-use of existing components and equipment. The first of five Beluga XLs will fly in summer 2018 and enter service in 2019. ONERA (Office National d’Etudes et Recherches Aérospatiales) is the French national aerospace research centre, with a staff of more than 1950. Under the supervision of the French Ministry of the Armed Forces, ONERA has an annual budget of 228 million euro, of which more than half is derived from commercial contracts. As the French specialist in aerospace technologies, ONERA prepares tomorrow's defences, addresses the aerospace challenges of the future and contributes to the competitiveness of the European aerospace industry. ONERA has expertise in all the disciplines and technologies in its aerospace fields. All major civil and military aerospace programs in France and Europe contain 'DNA' from ONERA: Ariane, Airbus, Falcon, Rafale, missiles, helicopters, engines, radars, etc. The German Aerospace Center (DLR) is the national aeronautics and space research centre of the Federal Republic of Germany. Its extensive research and development work in aeronautics, space, energy, transport, security and digitalisation is integrated into national and international cooperative ventures. In addition to its own research, as Germany's space agency, DLR has been given responsibility by the federal government for the planning and implementation of the German space programme. DLR is also the umbrella organisation for the nation's largest project management agency. DLR has approximately 8000 employees at 20 locations in Germany: Cologne (headquarters), Augsburg, Berlin, Bonn, Braunschweig, Bremen, Bremerhaven, Dresden, Göttingen, Hamburg, Jena, Jülich, Lampoldshausen, Neustrelitz, Oberpfaffenhofen, Oldenburg, Stade, Stuttgart, Trauen, and Weilheim. DLR also has offices in Brussels, Paris, Tokyo and Washington D.C.